The total value of the sector exceeded $8 billion, over than a billion more than has been recorded over the past decade. In fact, last year everything increased: Canadian television, Canadian feature film, foreign location and service production, and broadcaster in-house production. Canadian television, which some claim is at risk due to services such as Netflix, posted the largest expenditure ever (or least over the past two decades looking back at older annual reports). But the industry data explains where the money is actually going: online video services, which have seen increased revenues of more than $1 billion per year over the last four years. In fact, two Canadian online video services – CraveTV and Club illico – are estimated to have earned $373 million last year, up from just $13 million four years earlier. In other words, these are not “lost revenues”, but rather shifting revenues from traditional television packages to paid Internet streaming services. Further, movie theatre companies such as Cineplex have also joined the website blocking coalition, but their revenues have also increased in recent years. The Bell coalition claims that millions may be lost at the box office, but the data shows box office revenues increasing in Canada by 2.2% last year to a three-year high. The data also indicates that Canadian films consist of very a small part of overall revenues. English language films generated a total of $7.4 million for the entire year at the Canadian box office. With 113 English-language films playing in theatres, the average revenue for an English language film was just $65,000. Their issue is clearly not piracy, but rather a larger challenge of competing against U.S. and other foreign films for attention. Both the Bell website blocking coalition and those arguing for Netflix regulation are united in the view that the Canadian television production sector is at risk, either due to piracy or the presence of foreign streaming services that do not face “Netflix taxes.” For example, the Bell coalition website blocking proposal highlights the economic impact of the production sector and argues “left unchecked, piracy will dramatically erode the contribution of these companies and their employees to Canada’s digital and creative economies.” Those comments were echoed in a Globe and Mail article today in which Bell executive Randy Lennox argued that production is at risk without site blocking. Proponents of Netflix taxes or regulation claim that the emergence of unregulated streaming services such as Netflix will mean less money to support to Canadian productions. However, the experience to date is the completely the opposite with new streaming services investing in the sector and helping to propel it to greater heights. The increase in foreign investment in production in Canada is staggering. When Netflix began investing in original content in 2013, the total foreign investment (including foreign location and service production, Canadian theatrical, and Canadian television) was $2.2 billion. That number has doubled in the last five years, now standing at nearly $4.7 billion. 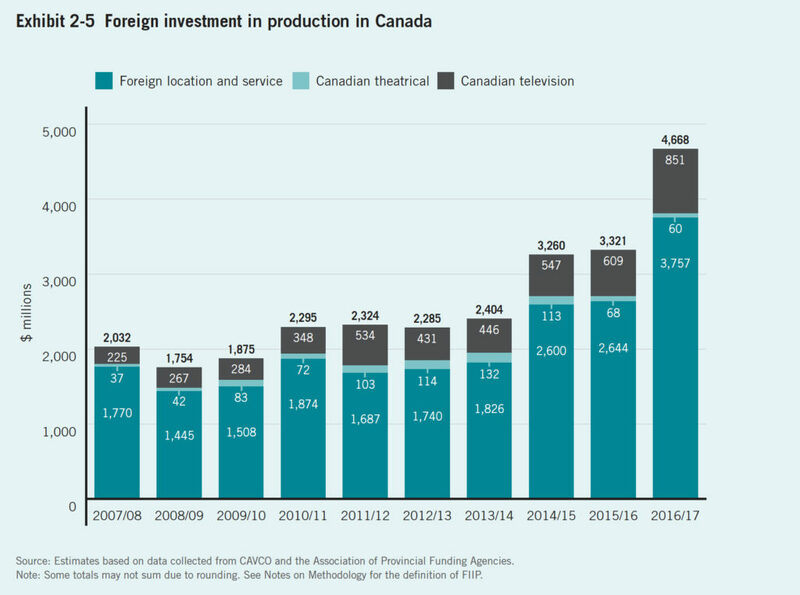 While much of that stems from foreign location and service production that supports thousands of jobs, foreign investment in Canadian television production has also almost doubled in the last five years. The data makes it clear that Netflix isn’t a threat, it’s an opportunity with new money entering the sector. Indeed, Canadian content production hit an all-time high last year at $3.3 billion, rising by 16.1%. Notably, the increased expenditures do not come from broadcasters, whose relevance continues to diminish year-by-year. In fact, the private broadcasters (led by Bell) now contribute only 11% of the total financing for English-language television production. Their contribution is nearly half of what it was just three years ago (now standing at $236 million) in an industry that is growing. Yet despite the private broadcaster decline, money is pouring into the sector from distributors (who see benefits of global markets) and foreign financing (which has grown by almost $200 million in the past four years) leading the way. The sector remains heavily supported by the public, with federal and provincial tax credits now accounting for almost 30% of financing. 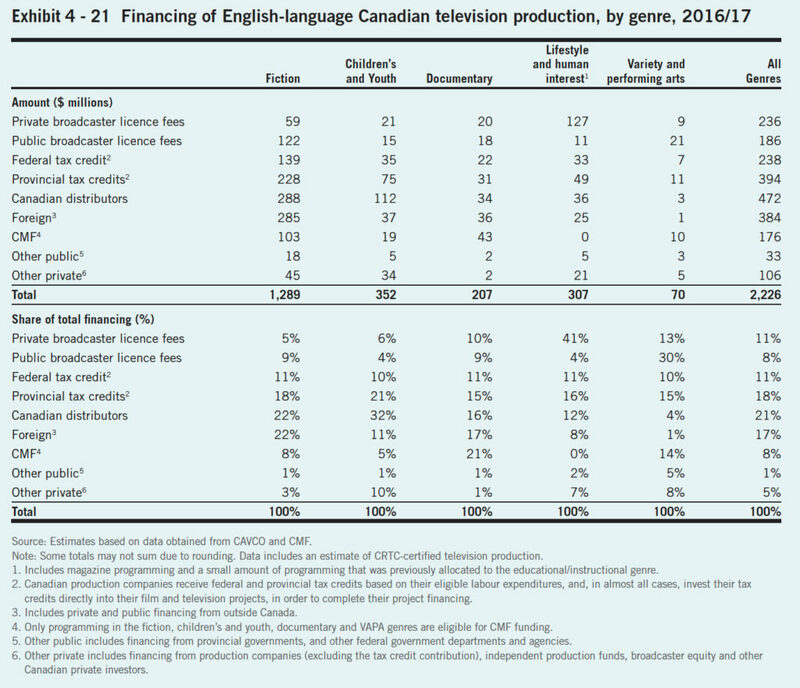 The increasing irrelevance of private broadcasters for financing Canadian television production is particularly pronounced in the fiction genre (ie. drama and comedy shows). This is easily the most important genre from an economic perspective, with $1.29 billion spent last year. Private broadcasters only contributed $59 million or five percent of the total. By comparison, foreign financing was $285 million. Those numbers should be considered with Netflix critics claim that an additional $100 million per year means very little. The Canadian industry data should be cause for celebration within the industry. The success story confirms that Canadian television and film production is far less dependent on regulation than is often portrayed with a sector that can compete on the global stage. Moreover, the data also undermines far-fetched claims from the Bell coalition that the industry is in crisis and that drastic measures such as website blocking are needed to save it. Billions of dollars are entering the marketplace with Canadian production at an all-time high, meaning politicians and regulators should avoid hitting the panic button and resist harmful policy proposals that are inconsistent with actual industry data.